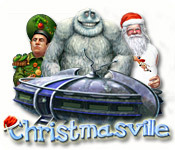 Christmasville is rated 3.5 out of 5 by 36. Rated 5 out of 5 by Kayster from Silly and lightweight, but very fun, game This game is my shameful Christmas addiction. It is adorable and full of terrible puns and jokes. I love the characters, with all of their quirks. This is a simple game but not especially a child's game (the story line is not really child targeted). It is an older game so the graphics are not quite up to current standards but I still pull it out every Christmas season to play a couple of times. If you like quirky fun without expecting too much intellectual challenge, you might like this game as much as I do! Rated 5 out of 5 by iou001 from Abominably Cute I really enjoyed this game. It's one of the few games that I didn't skip through the dialogue because the dialogue was actually funny and not haunting. I even read the credits that were funny but went by to fast for these old eyes to keep up with all of them. The artwork was very good and had some very well hidden objects through out the game. I really enjoyed the storyline even though I dont think it is suitable for kids under 13. I don't think little kids would understand what's going on. I would like to see more games by this talented group. Rated 5 out of 5 by Palenque1978 from Love it! I played the trial version and when the hour was up, I HAD to the game. I'm glad I bought it. It's funny, definately not difficult, in fact it's very easy. It's just great fun. This game entertained me and I think it would be fun for kiddies as well, Wish I had a little kid to play this game with me. Rated 5 out of 5 by esmeqt from Quirky Christmas Fun This is an odd and hilarious little game. It's not particularly deep, but it is incredibly funny and an absolute delight. I try to play it every holiday season. You play as a detective called upon to find Santa, who has gone missing. With the help of a sassy elf, an adorable snow monster, and others, you go deeper into the madness to find Santa and save Christmas. The graphics may seem a bit dated now, but do not inhibit my enjoyment of the game. The music is fun and funky. The games are enjoyable, but not difficult. This is a great game to amuse, relax, and play just for the fun of it. It will take you to some weird places, but just relax and enjoy the ride! I laughed a lot at this quirky little gem. It's one of the favorite games in my collection! Rated 5 out of 5 by Gretty from Very fun game The music is great & the characters are fun with an interesting story line. A relaxing downtime during the holidays. Rated 4 out of 5 by Eveoflove from A series of HO and mini-games Review based on completed game. CHRISTMASVILLE comes without any difficulty settings, but I don't think it matters: all levels give you 5 minutes or more to complete each task. Should you fail, you simply re-start that level; you can also replay any stage, but there is nothing to "collect" or a "best score" to beat: pretty much a stress-free game! 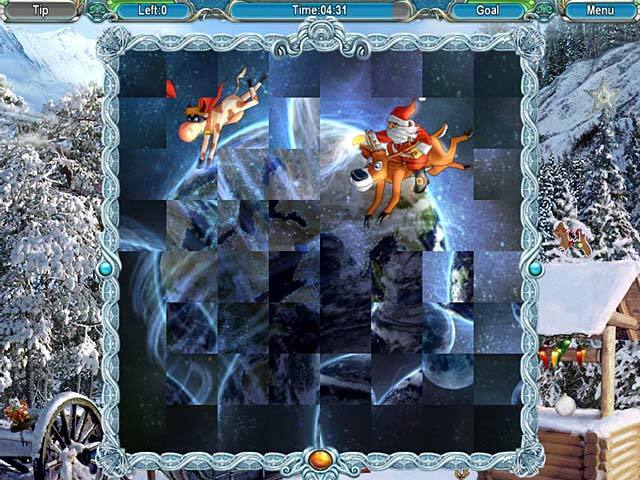 The game is about finding Santa who has disappeared, so you will encounter some light-hearted characters (Elf, Reindeer, Abominable Snowman, etc.) to help you in your travels as you explore various locations. There are many conversations (each can be skipped) that help shaping the storyline. Unfortunately, there are a few typos late in the game (e.g. "televion" instead of "television"), but I didn't encounter any during the Hidden Object (HO) levels. There are 20 "stages", and each stage consists of 3 (or more) levels; the HO scenes are either of "list" or "silhouettes/outlines" types of about 12 items to find; I thought they had just the right level of challenge: the scenes are well depicted with clear graphics, but I admit the "silhouettes/outlines" could have been sharper... having 5 minutes to resolve each is more than enough: you'll generally use only half of that. 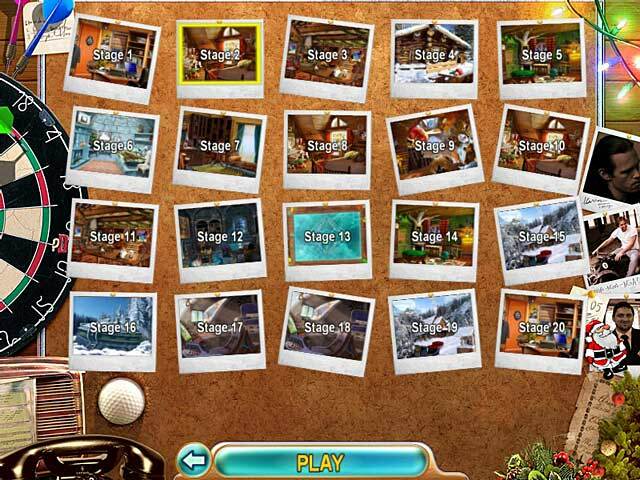 There are also a number of mini-games to add variety to the gameplay, each of which can be skipped. I had fun playing this game: no demons, spirits or evil entities: even the "abominable" snowman is kind hearted and likeable. Try it for yourself: playing 1 or 2 stages will give you a representative sample of the game. Not spectacular, but fun for all ages. Finally, I played this game using Windows 10 without any issue.